"Man on Wire" may very well be the most entertaining documentary I have ever seen. 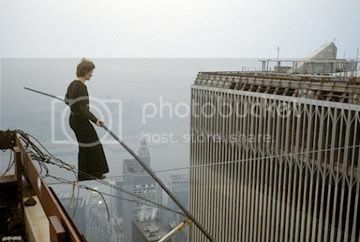 It's a breathtaking journey following tightrope walker Philippe Petit fulfill his dream of walking on a wire between the two towers of the World Trade Center. At the age of 24, he accomplished his goal on August 7th, 1974 and was arrested by the police under charges of disturbing the peace. It was considered the most artistic crime ever committed. Philippe crossed the wire not once, but eight times, spending nearly an hour up there dancing for his audience far down below and taunting the approaching police. Directed by James Marsh, this is a documentary that plays out like a live-action film, creating an exhilarating hybrid of real footage, interviews, and reenactments. What makes this documentary so fascinating is that we hear it directly from Philippe Petit himself and all the people who helped him along the way. It makes for not just an accurate retelling but also simply great storytelling. Sitting in the dentist's office one day, he found out about the construction of the World Trade Center hearing that they would be the tallest structures in the world. He knew at that moment he wanted to conquer them. He built a wire setup in France that replicated the distance he would have to walk over in America, and he had his friends shake and twist the wire to represent the winds he would be facing. It took many trips to New York City to figure out how to get all of the equipment up to the roofs of the towers. To Petit, planning this was equivalent to planning a big bank heist. It raised the same stakes, and they were all putting themselves at risk. It's the small details and the fascinating aspects of the tale itself that make "Man on Wire" such a riveting and extraordinary documentary. Petit proves to be a marvelous narrator, along with his girlfriend at the time, Annie Allix, who describes the aftermath of it all back safely on the ground. What starts off as an exercise in audacity transforms into an exercise in artistry. All of those assisting Philippe knew that what he was going to do was daring and dangerous, but they followed him anyway, and in the end, it turned into something entirely glorious. And, as viewers, what we witness at the end of it all is something poignant and poetic. Philippe Petit fulfilled his dream, a dream that had him suspended above the air at 1,350 feet with nothing able to stop him. Archive: 'Before The Devil Knows You're Dead"
The Toss-Up For Original Screenplay?